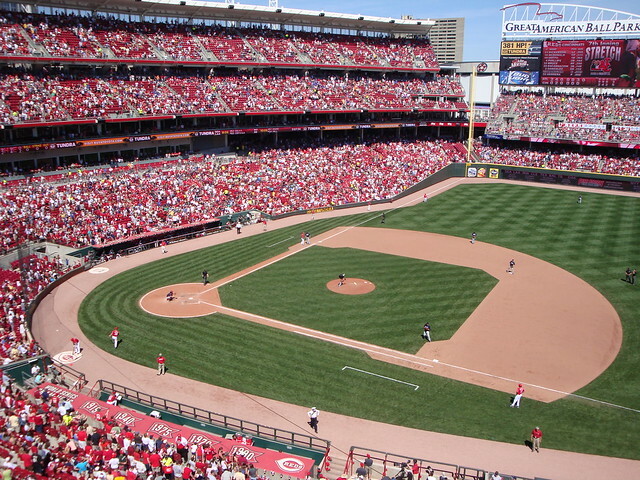 JULY 11, 2012 — CINCINNATI, OHIO — More than 200 musicians will descend upon the Great American Ball Park to perform the national anthem before the Cincinnatti Reds open their home series against the Milwaukee Brewers on Friday, July 20. "We will have upwards of 450 instruments on the diamond," says Daniel M. Reck, one of the musicians. "Or we'll have just one really big one, depending on how you look at it." They musicians will be performing "The Star Spangled Banner" on handbells. Most will play two bells, while some as many as six. Together, they hope to set a record for the largest ensemble to perform "The Star Spangled Banner" at a baseball game. OCTOBER 20, 2011 — DAVENPORT, IOWA — Since 1937, Jamboree Today newspaper has been providing "the news you can use" to participants at National Scout Jamborees. "It's a proud tradition," says Daniel M. Reck, a Unit Commissioner in the Boy Scouts of America's Illowa Council, which serves the region surrounding the Quad Cities. "I was proud to serve during the Boy Scouts' centennial celebration in 2010," he says. Reck will be returning to Jamboree Today again at the next National Scout Jamboree in 2013 after being appointed this week appointed as social media editor. "In 2010, I was asked to launch Jamboree Today's online presence," Reck says. "Within hours we had thousands of people interacting with us. It was fantastic." While serving as a copy editor for the paper, Reck monitored social media sites like Facebook and Twitter for talk about the jamboree, and he interacted with parents and Scouters from around the world who were unable to attend. "When I discovered a post from one father at home about talking with his son at the jamboree through Apple FaceTime, I knew there was a story," Reck says. JULY 17, 2011 — MINNEAPOLIS, MINN. — Startled patrons in the lobby of the Minneapolis Hilton hotel looked around in confusion as two dozen handbell musicians ambushed them in a flash mob today. Daniel M. Reck was among the performers, led by Rima Grier, who parodied "Mickey, You're So Fine" and "La Bamba" with new lyrics about how any kind of music can be played on handbells. The stunt was to help publicize tonight's handbell concert at the hotel. "We know how to have fun," says Reck, "but we're also working to show that handbell musicians are like just like any other musicians." Tonight's concert will feature Reck in one of the two National All-Star Handbell Choirs, along with an advanced group of teenage musicians which has participated in a series of special classes over the weekend. The entire event is the finale to the American Guild of English Handbell Ringers National Seminar, which combines a mult-day professional conference with marathon rehearsal sessions. "It's been a great deal of hard work to prepare," says Reck, who successfully auditioned into the ensemble as its bass ringer. "The all-star ensembles are each performing four advanced works with about six hours of rehearsal before the performance." MARCH 28, 2010 — MONMOUTH, ILL. — An educator at Monmouth College has been selected to represent the Boy Scouts of America at the 22nd World Scout Jamboree in Sweden this summer. Daniel M. Reck will join the International Service Team, which includes jamboree staff members from around the world. "Scouting is sometimes called play with a purpose," says Reck. "At the world jamboree, young men and women from nations near and far will have a chance to come together, share their cultures, develop respect, and do it all while having the time of their lives." The World Scout Jamboree, held approximately every fourth year since 1920, plans to host about 38,000 scouts from the 160 nations which have national scouting federations participating in the World Organization of the Scouting Movement. This is Reck's third jamboree staff appointment. Last summer, he was a copy editor at Jamboree Today, the daily newspaper of the 2010 National Scout Jamboree hosted at Fort A.P. Hill in Virginia. He volunteered as an emergency medical technician in 2001.